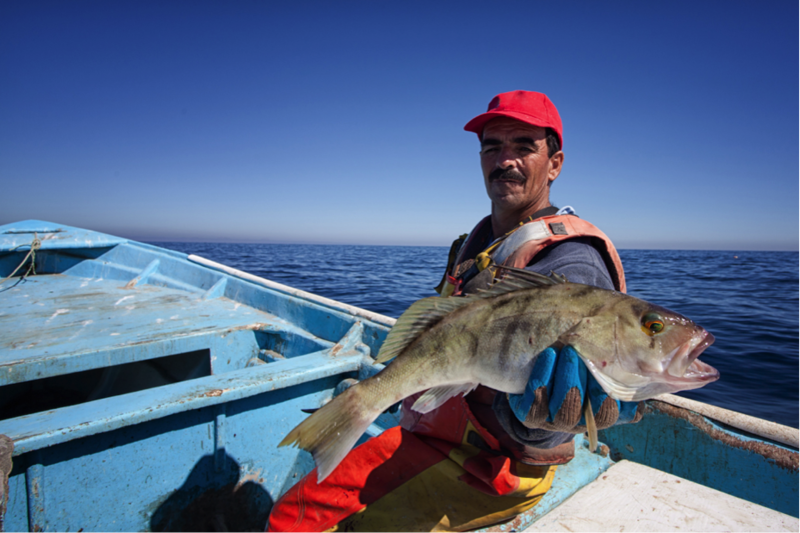 The SmartFish Group, a social enterprise, directly incentivizes Mexican artisanal fishing cooperatives to improve their environmental and social performance. SmartFish NGO incubates worthy co-ops to market readiness with responsible seafood, empowering fishers to catch and produce high quality, responsibly caught seafood to overcome the vicious cycle of overfishing. SmartFish Inc. acts as a "good intermediary," placing their triple impact seafood into prefential markets with transparency and traceability, rewarding them for their responsible practices. SmartFish is bridging the gap between artisanal fishers who are committed to sustainable fishing practices and social justice, and consumers seeking healthy, sustainably caught seafood. To help fishermen and their families overcome the vicious cycle of overfishing, SmartFish incubates strong, artisanal fishing co-ops to improve their fishing, handling, processing and business practices to rescue the value of their catch and produce premium quality seafood that is independently verifiable as socially and environmentally responsible or improving. SmartFish’s Value Rescue intervention treats artisanal fishing as a complex system, taking into account factors from social dynamics in remote fishing communities to consumer preferences and trends. This integrated approach ensures that access to preferential markets is tied to sustainable fishing practices and that increased income does not increase overfishing. 80 percent of the Mexico’s fisheries have been pushed to or beyond their biological limits and are in need of strict management plans to restore them. In response to this growing threat, Smartfish integrates diverse stakeholders to share social intelligence on the value of sustainable fishing. For this to be effective, Smartfish knows that it has to work with the right people. That is why we establish relationships with and between reputable co-ops, NGOs, fisheries and fisherman who promote sustainable fishing practices. To cultivate a market for this sustainable seafood, Smartfish connects responsible fisherman who supply the best quality seafood with the restaurants who demand it. To support and protect the efforts of sustainable fisherman, we work to design and implement proper fishery management to conserve ecosystems, but also sustain livelihoods and ensure food security. To ensure no value is lost in sustainable artisanal fishing Smartfish uses these building blocks to bring the right people together to design and implement effective and responsible fishing practices. • Unprecedented supply of responsible seafood in México. Our triple bottom line: fishers can earn more catching less, avoiding overfishing and bycatch; their relatives (majority women) earn new wages processing their catch; and SmartFish makes a margin to scale this success. S. Hoyt Peckham: In 2009, we began experimenting with entrepreneurial approaches to incentivizing higher sustainability fishing here in NW Mexico. This opportunity arose from years of partnering with fishermen to increase the selectivity and reduce the megafauna bycatch of small-scale fisheries here. Among other results, certain visionary fishermen wanted to try switching back to hook & line and other gear more selective than gillnets, as long as they could find away to do so more profitably. We realized that we could probably align fishing with sustainability objectives and thus overcome the cycle of overfishing. In 2010 we used philanthropic funds to conduct a market study and plan with fisher leaders and in partnership with five fishing cooperatives of the Bahia Magdalena region form the social venture Productos Marinos Sustentables (ProMar) to pilot how we could rescue the value lost in some of their undervalued, reverse alchemy fisheries. Strong demand for ProMar’s zero bycatch, higher sustainability seafood enabled ProMar to generate impressive social, environmental, and economic outcomes. However, that same demand also presented ProMar’s greatest challenge: maintaining catch rates high and consistent enough to meet that demand and retain clients despite seasonal variability and the ProMar members’ opportunistic practices of switching between fisheries. 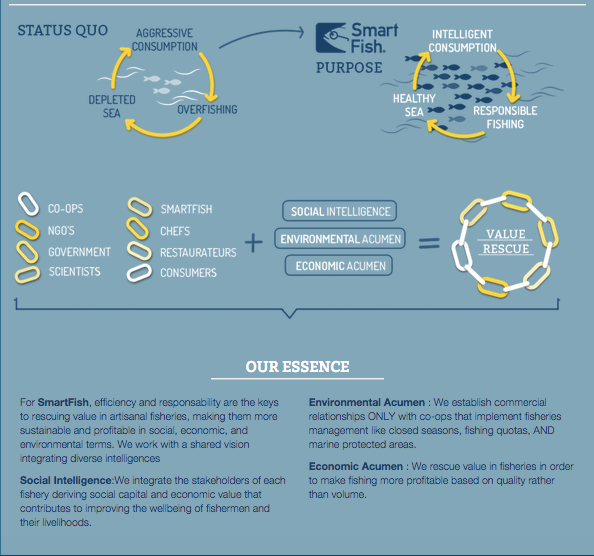 We launched SmartFish AC in 2013 to formulate a business approach to incentivize higher sustainability artisanal fishing by empowering fishermen to rescue value in their undervalued fisheries. To make their sustainable fishing practices more profitable, we have begun building preferential markets for their fish, creating both supply and demand.